We were commissioned by Presentation Design Services to create the life-size bull. The sculpture had to be water proof, extremely durable and friendly looking. 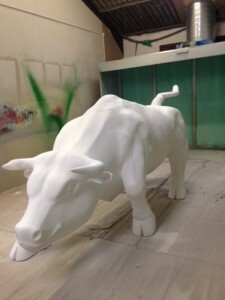 The bull was hand carved out of high density polystyrene. Steel rods inserted within the tail for extra strength and timber blocks within hoofs for installation system. As the sculpture had to be weather proof we applied flexible coating polyurea and primered in order to prepare for a paintable surface. Final finish was completed by PDS to their clients specification. We are very proud to have completed this project at a very tight time schedule and have completed within a week! Just in time for our client to apply final finish. We were commissioned by Tom’s shoe UK to scale up one of their classic shoes. To be use as a prop at their customize your sole events all across the UK. 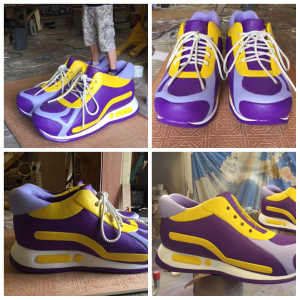 We hand carved the shoe according to the life-size version. After shaping and preparation we spray applied flexible coating polyurea which makes the end product weather proof + extremely durable. This coating also has a rubbery texture making the surface even more so realistic. After coating application we primed and spray painted the giant shoe white ready for our clients artist to customize as they wish. 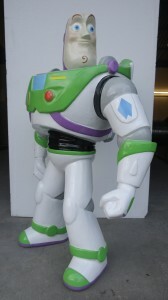 We scaled up a tiny model to create a life-size version of Buzz light year for Marbel Toys Ltd to use as a prop at their exhibition stand.This giant 3D model was hand carved out of polystyrene, sanded to a smooth surface. Weights installed within the model to ensure stability. Application of hard coating polyurethane. Extra sanding for a glossy finish. Airbrushed up to detail according to Buzz light years original colors. 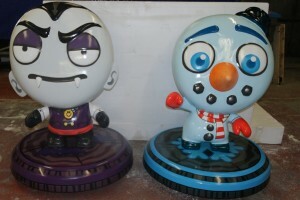 We were commissioned by Inition – London to create 1.20m in height 3d models Frosty and Drac. The heads of the models had to be the same shape as the babybel cheese. We scaled up the models from given design. We carved the models out of High density polystyrene and coated with FR hard coating application polyurethane. The models were then spray-painted with a primer. We then decorated and airbrushed with high quality 2k paints. The base includes steel weight support + a plywood applied at the bottom of the base for extra strength. We were commissioned by Splendid Communications to produce a giant Marmite lid to use at their Marmite fan campaign.This fun and unique prop was carved out of polystyrene, a layer of hard coating polyurethane was applied. 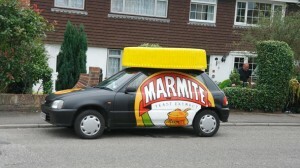 To finish, airbrushed to replicate the real Marmite lid. We created a giant trainer shoe with laces. This prop was carved and sculpted out of high density polystyrene. Hard coating polyurethane application. A combination of smooth and textured surfaces. Primer paint, variety of 2k colors applied, giant pink laces for realistic effect to finish. We were commissioned by Marbel toys to create a 1.50m in height version of their miniature model of Elsa. The model was carved out of high density polystyrene proportionally. A stainless steel pin was fitted within her arm and finger for extra strength, with a plywood base at the bottom of the model for extra support. After sanding to smooth surface in preparation, FR polyurethane coating was spray applied. The sculpture was then spray painted with a primer. 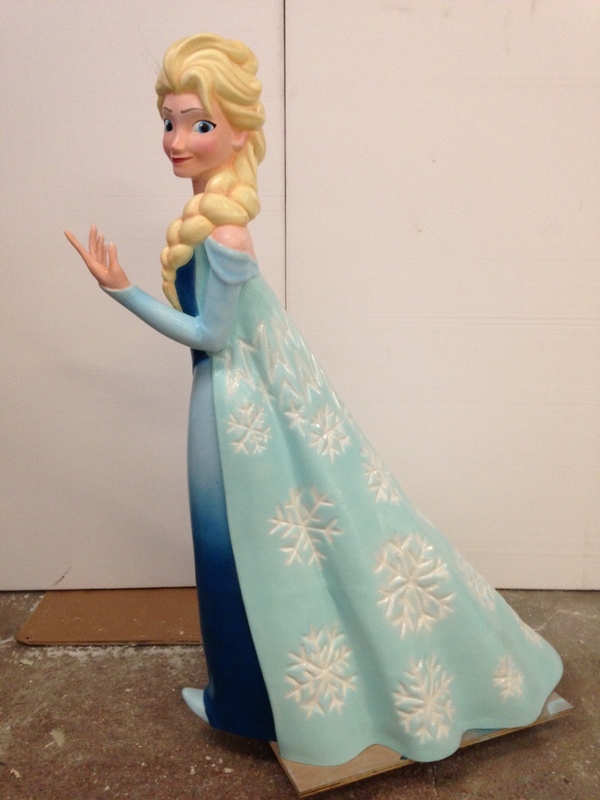 Once dry we airbrushed the colors and tones with HQ paints according to miniature of Elsa. As a finish we gave the model some shading with airbrush for a better effect. We were commissioned by Mad Science to create an interactive, light weight & child friendly oil drum to use as a prop at their workshop.The oil drum is carved out of polystyrene, sliced accordingly for the puzzle. Coated with polyurethane hard coating. Sanded to a smooth and glossy surface then painted and airbrushed to the desired effect. Velcro applied in between each slice to make a good fit when assembling the stacking puzzle. To finish vinyl applied according to our clients request. We made this giant 3D prop / theme park element based on 3 different dragon sketches! 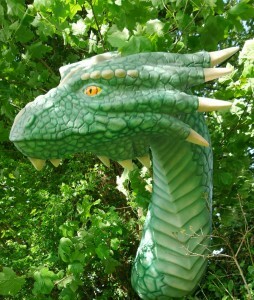 We hand carved and sculptured the dragon out of polystyrene, coated with polyurethane hard coating. Airbrushed and decorated up to detail for final realistic effect. We created these giant pants including steel stand together with the Charity Pants Cancers for their campaign to raise awareness. We made this giant prop carved & sculpted out of polystyrene. With a fitted installation system to be fixed onto the galvanized steel stand. The prop was then coated with hard coating polyurethane to ensure it will be weather proof. Then to finish painted & airbrushed white to emphasize the lace effect. 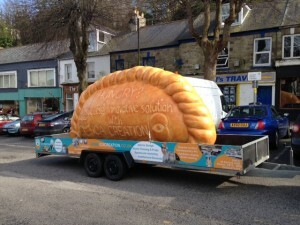 We created a giant pasty with a stand & installation for a trailer. We were commissioned by leading Cornish bakery Prima Bakeries. We created this giant prop carved and sculpted out of low density polystyrene, then we fitted a steel support system & galvanized steel stand for stability. Hard coating polyurethane, application for durability and to make it waterproof. To finish we applied primer paint & airbrush decoration for a realistic effect. We scaled up a miniature version Of Matt. The procedure was to hand – carve the sculpture out of polystyrene. We installed steel pins in his arms to give him extra strength! We fitted weight support in his feet to give him stability. Hard coating polyurethane application to give him durability and to make him water-proof. The surface is a textured finish + airbrush decoration to match colors. He looks like he is ready for some action! 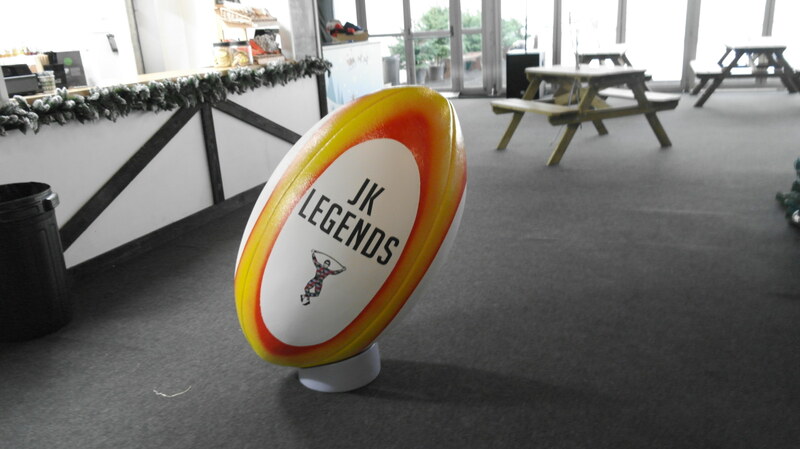 We created a giant size rugby ball with tee as a stand, with replaceable vinyl for text. This giant surreal prop was carved out of polystyrene and sculpted to shape. The prop was then coated with hard coating polyurethane. Once coated to ensure its weather proof, it was airbrushed for realistic and bright colored effect. To finish we hand crafted, the over sized tee to ensure a perfect fit. We made a giant book with an enchanted wood effect. Giant prop hand carved and shaped from polystyrene, letters engraved, coated with polyurethane & airbrushed to create a wooden effect. We created a giant hand. Great to use as a pointing sign or holding a board. Carved and sculpted out of polystyrene. Coated with a layer of hard coating polyurethane, then airbrushed for final realistic effect. We were commissioned by Retallack Resort & Spa to create playful penguins to use as props at their magical winter wonderland. 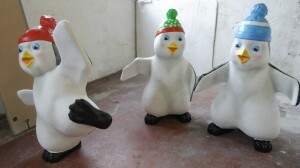 Custom made penguin props, carved and sculpted out of low density polystyrene, hard coating polyurethane application to ensure durability. To finish we applied primer paint & variety of colors including glitter for the jackets! Airbrush decoration to complete the desired details. 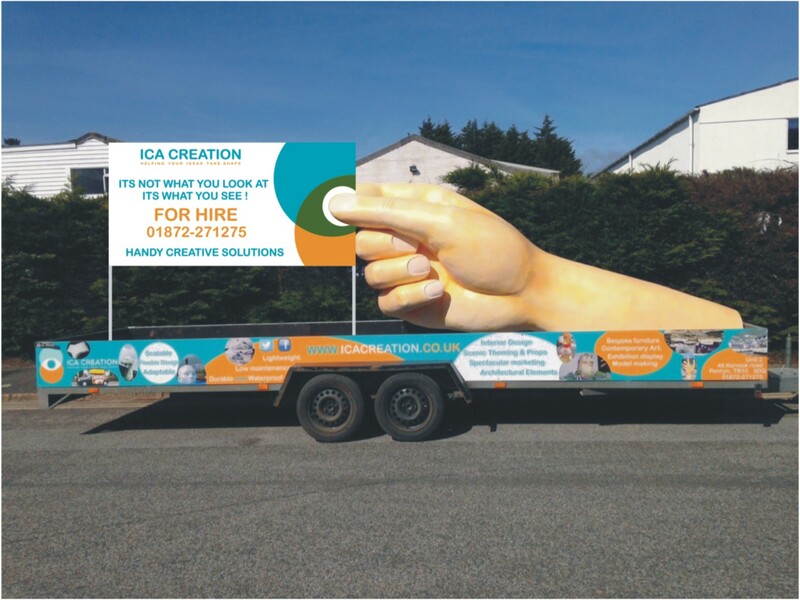 We were commissioned by VKN projecten from the Netherlands to spray apply flexible coating application onto supplied giant Dutch Tulip creations. 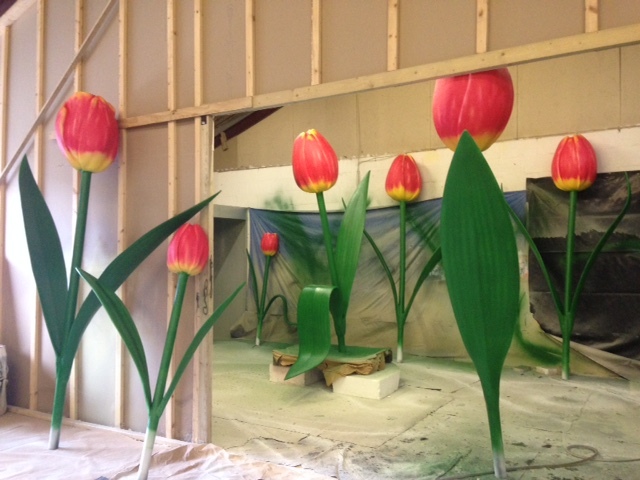 After polyurea coating application we spray painted the giant tulips with a primer. 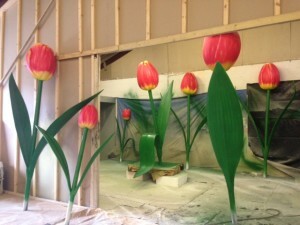 Then as a finish we airbrush decorated the tulips as realistically as possible. 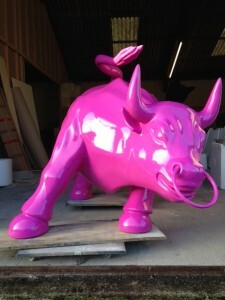 We were commissioned by Paragon Interiors to create a quirky pink bull to be installed at the new offices of Cooper parry in Birmingham. The bright eye catching sculpture was to be used as a fun bespoke interior element. The sculpture was shaped / hand carved out of high density eps, scaled proportionally to required size. Coated with impact resistant / water proof FR polyurea. Sanding and preparation work for a smooth surface. Primer and topcoat colour spray painted. We were commissioned by Juergen Teller Ltd to create two of 1.20m in diameter size dinner plates with HQ images applied onto each plate. To create the plates we first made a mould. From this we created the plates with fibre glass. 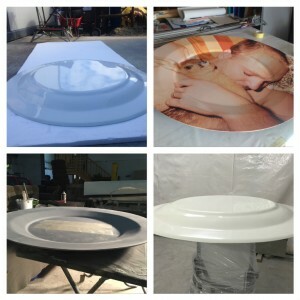 Once the plates were smooth we applied a base coat and topcoat spray paint with a high gloss white finish. Once completely dry we vinyl wrapped the plates with the required HQ images. We were commissioned by Goal agency to create a giant Polaroid carapace to be used by Goal as a photo booth at festivals and events. We scaled up the Polaroid camera they supplied us keeping the proportions as close as possible. The giant Polaroid was made from exterior plywood and a combination of materials such as perspex. The camera is built in 3 sections of easier transport also it has 2 lockable doors to keep the technical equipment by Goal. The camera was primed and spray painted white. We were commissioned by Nestle Purina to create an approx. 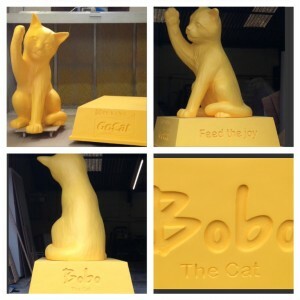 2m high cat sculpture of Bobo with a plinth. The statue like sculpture was hand carved from high density EPS. using a small clay model we created as reference, coated with FR polyurea coating. This coating makes the sculpture water and impact resistant. The base was created out of polystyrene with CNC engraved text at each side of the base. The base was also coated. Both the sculpture and the base have weight support installed for stability and they are separate pieces for ease of transport + mobility. After coating and surface preparation we primed the sculpture. Once this layer was fully dry we spray painted the sculpture with a special water based spray paint to a bright yellow! We were commissioned by Practical Minds Ltd to create a bespoke piece for special window display for an incredible fashion designer. 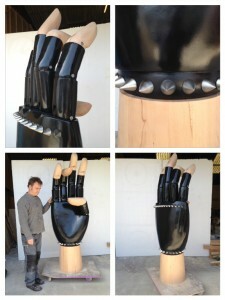 We created an over sized mannequin hand with movable fingers, and chrome effect studs. 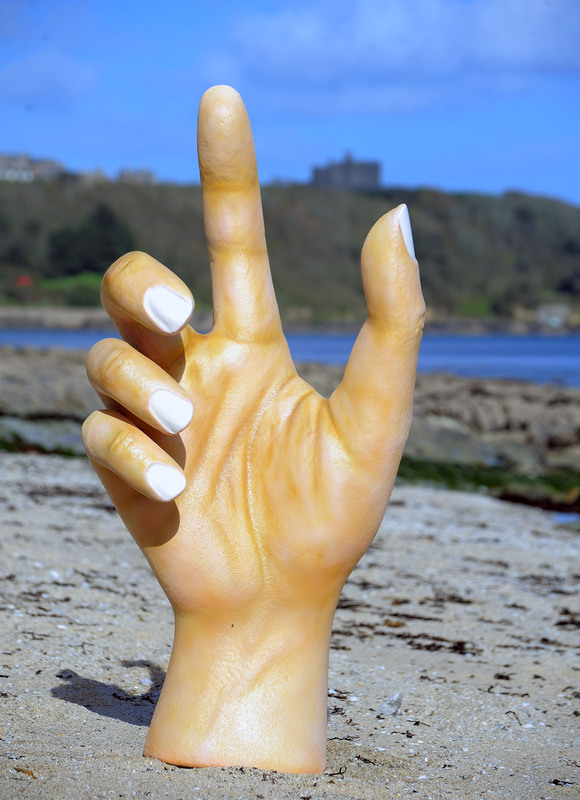 The hand was made from a combination of materials, for the finger tips and base we used beech wood and the palm was carved from EPS, coated with FR polyurea and spray painted black. We created an inner structure to make the fingers position adjustable like a mannequin. The studs were created with a wood turner and then spray painted to a chrome effect. 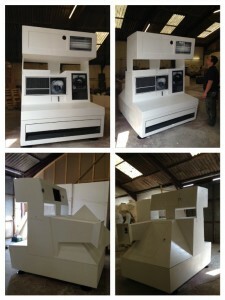 Check out our blog to have a look at some images of process and completion! 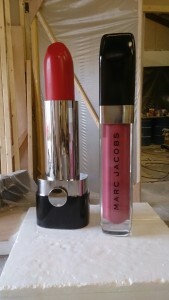 We were commissioned by Practical minds to scale up the lipstick and lip-gloss from Marc Jacob’s up to 1.5 m high, to be used as elements for special display. We used a combination of materials to achieve a realistic look whilst being hard wearing. The materials we used include stainless steel, polystyrene, fibre glass, wood, acrylic, spray paint. Both elements were created by hand and finished to a high spec. We were commissioned by phonaudio who create luxury headphones with maximum comfort & the ultimate sound experience to create 3m high replica of the phonaudio headphones. We used a combination of materials to achieve a realistic and durable giant version of the head phones. materials we used to create include, exterior ply wood, EPS, aluminium, soft foam, up holstered pu leather, fr coating polyurea all finished to a high spec. 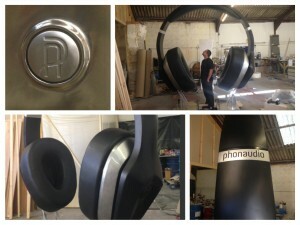 The head phones will be used as special display with a wow factor at phonaudio’s events, music festivals. Click here to view more images of this project! 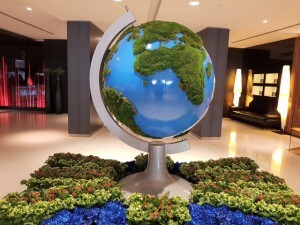 We were commissioned by Chic flower design to create the scaled up globe. 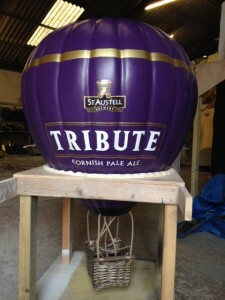 We used a combination of material’s to create the globe including EPS, polyurethane foam, fibreglass, ply and aluminium. Spray-painted to colour final creative live finish by Ami and her team. 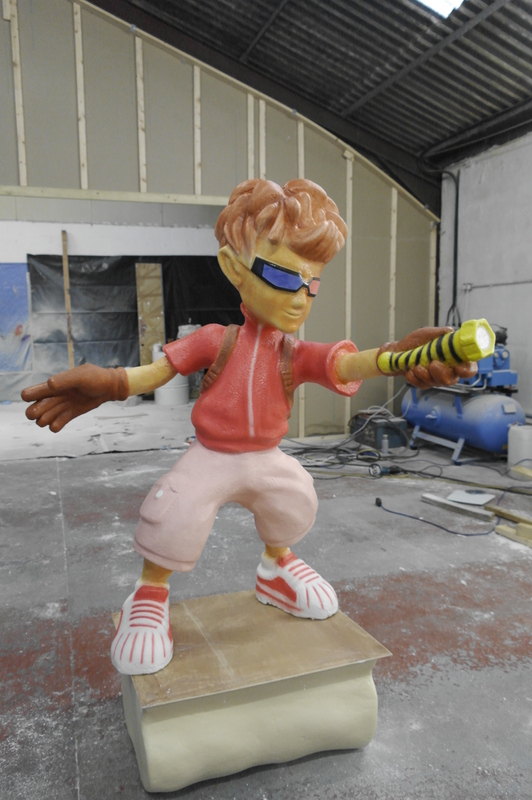 We were commissioned by Studio Tac to create the sculpture for their client Gorillaz the virtual band. 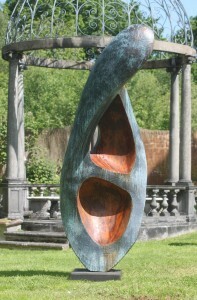 The sculpture was hand carved out of high density PU foam according to supplied images. Once carved and prepared it was coated with fr polyurea in order to make the sculpture water and impact resistant. As a finish spray painted and decorated. 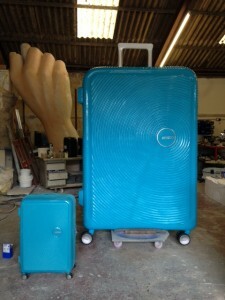 We were commissioned by the PLB group to create the scaled-up version of the suit case for their product launches across the UK. The giant suit case measuring at 2.5m high had to be realistic as possible. 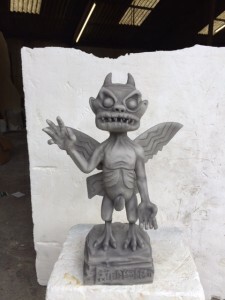 The replica was created from a combination of materials including EPS, CNC cut elements, FR polyurea coating, primer and spray paint + all details to make it look authentic. 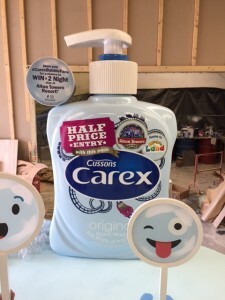 We were commissioned by Zeal creative to create the bubble face stand as a photo opportunity to at Alton towers. The stand is both promotional and a fun concept. The base was created with exterior ply and coated with polyurea. 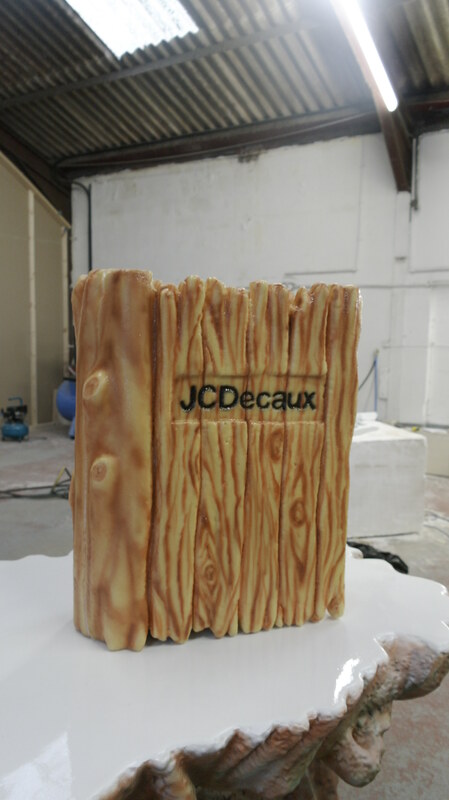 The hand soap bottle is carved out of EPS, coated with FR polyurea, spray painted to requested colours + vinyl application. The bubble face stands are made from aluminium with a ex plyframe, inside the frames acrylic + vinyl of the emoji faces. We were commissioned to create the 4 foot long wasp to be used as quirky signage. 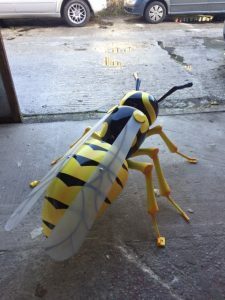 The wasp was made using a combination of materials such as polystyrene, aluminium, Fr polyurea coating application, Perspex for the wings. Once coated with polyurea it was primed and prepared for final spray paint & decoration. It includes a fixing system in order to install on top of clients vehicle. 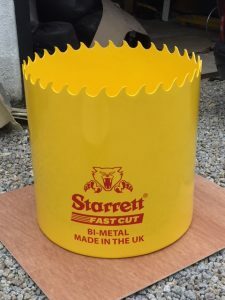 We created an 800mm high replica to a hole saw to be used as an eye-catching tool at LS Starett’s Exhibitions & events. We created the replica out of fibre glass as the prop had to be hollow. The most important aspect besides a close replica was to imitate steel. The fibre glass prop was then sprayed painted to a bright traffic yellow followed by the companies logo / vinyl application. We created the custom Top hat prop for our client to be used as a prop alongside their world class acrobatics performance. It was created and customised to our clients specification as well as looking good it had to be made practical. 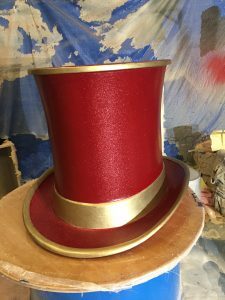 The top hat prop as created out of a combination of materials including polystyrene, ply wood, water & impact resistant FR polyurea coating, colour matched spray paint and gold + glitter to give the prop an extra sparkle. 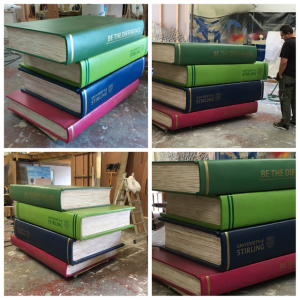 We created a giant stack of books for Stirling universities graduation ceremony 2018. 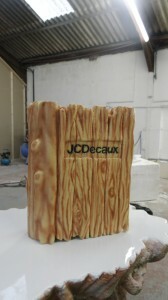 The books were hand carved and made out of a combination of materials including: polystyrene, plywood, polyurea coating, top coat colours spray painted + shading with airbrush. As a finish vinyl for the logo and tagline. The prop had to be as realistic as possible whilst being practical and durable as it can be used indoors and outdoor events. The giant stack of books added an element of excitement and a fun photo opportunity to the graduation ceremony. We were commissioned by Banana Kick to create the oversized trainer props. 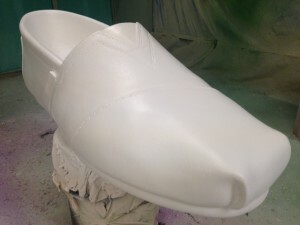 Using the spec provided to us by client, we hand carved the trainers out of polystyrene, then coated with fr polyurea to make the prop both water & impact resistant. 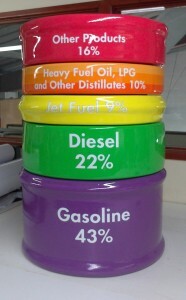 Once coated and prepared we primed followed by spray paint with the colour numbers provided. 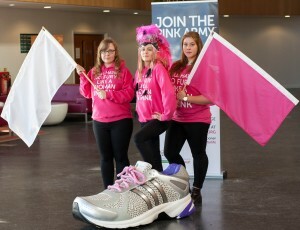 The trainer prop was then used at many events to raise awareness. 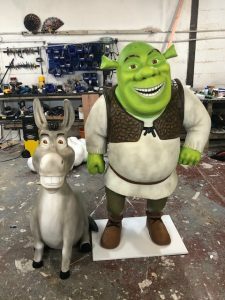 We were commissioned by Chic flower design to create Shrek and donkey 3d models for their Festive display Both life size 3d models were scaled proportionally and hand carved out of polystyrene, coated with FR polyurea. Spray painted, and hand decorated. It was great to collaborate with Chic flower design on these fun characters for their Christmas display.